^ 張偉國. 創造中文報業奇蹟的《大紀元》. RFA. 2003-11-18 [2013-05-16] （中文）. ^ 2.0 2.1 RSF記者無國界. Epoch Times manages to negotiate a deal with a printer. 2005-05-16. （原始内容存档于2018-11-10）. ^ 3.0 3.1 記者劉嘉韻. 大紀元時報日報版創刊 願當台灣媒體清流. 台灣台北. 中央通訊社. 2005-03-14. ^ 4.0 4.1 Groot, Gerry; Stafford, Glen. China and South Australia. (编) John Spoehr; Purnendra Jain. The Engaging State: South Australia's Engagement with the Asia-Pacific Region. Wakefield Press. 2012: 103. ISBN 9781743051573. In related vein, another paper with wide distribution but published elsewhere is Epoch Times (Dajiyuan shibao), the qigong meditation religious group Falun gong mouth-piece, which runs a strong anti-communist line. ^ 《香港大紀元》逆市成長 250多報檔首銷. www.ntdtv.com. 2016-03-22 [2018-12-11]. ^ Paper denies representing Falun Gong. Washington Post. [2015-12-04]. ^ 8.0 8.1 英文大纪元主编致读者的一封信. 大纪元. 2018-10-24 [2018-10-27]. ^ Susan V. Lawrence. Falun Gong Fields Media Weapons. THE WALL STREET JOURNAL. [2018-01-04]. ^ Epoch Times has 17 Languages on the Web. En.epochtimes.com. [2013-05-16]. ^ Annual Report on American Journalism. State of the News Media. 2009. （原始内容存档于2009-12-13）. ^ Gossett, Sherrie. Independent Chinese Newspaper Bucks Communists. Accuracy in Media. Accuracy in Media. 2005-06-15 [2013-10-19]. ^ Ownby, David. Falun Gong and the Future of China. Oxford University Press. 2008: 223. ISBN 9780199716371. ^ Ownby, David. Falun Gong and the Future of China. Oxford University Press. 2008: 8. ISBN 9780199716371. ^ Ownby 2008, p. 221. ^ Hua, Vanessa. Dissident media linked to Falun Gong / Chinese-language print, broadcast outlets in U.S. are making waves. San Francisco Chronicle. 2005-12-18 [2006-12-09]. ^ Peter Schworm. Chinese-American activists decry China's communism. The Boston Globe. 2007-12-03. ^ Thomas Lum. China and Falun Gong (PDF). Congressional Research Service. 2006-08-11. （原始内容 (PDF)存档于2012-02-05）. ^ 關於大紀元. The Epoch Times. ^ 記者無國界組織 Reporters sans frontières – China. Rsf.org. [2009-12-18]. （原始内容存档于2009-06-05）. ^ 張強. 分析：互联网的民主力量引起反弹. BBC中文網. 2005年9月26日 [2008年3月27日]. ^ 关于大纪元 - 大纪元. 2002-07-26. ^ 练乙铮. 香港书商事件折射中共高层权力斗争（中英文）. 紐約時報. 2016-01-21. （原始内容存档于2017-08-29）. ^ 大纪元郑重声明 - 大纪元. 大纪元 www.epochtimes.com. 2005-01-13 [2018-12-11]. ^ 吴雪儿. 起义官员抵港 曝光国内退党潮真相：在台寻求政治庇护未果 在香港有7天居留期 盼国际援手. 大紀元時報. 2006年10月27日 [2008年3月27日]. ^ 賈甲棄中共官職 起義見證退黨潮. 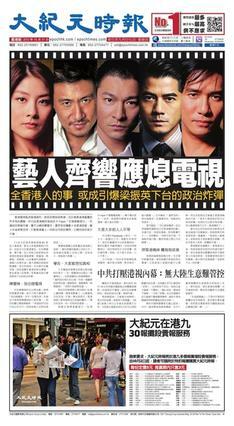 新紀元週刊. 2007-04-12. ^ 李怡. 李怡專欄：還要「真、善、忍」嗎？. 蘋果日報. 2006-03-09 [2015-11-29]. ^ The Epoch Times Wins Prize for Human Rights Reporting. En.epochtimes.com. 2006-05-10 [2013-05-16]. （原始内容存档于2008-03-08）. ^ 戴德蔓. 大紀元時報榮獲台金峰獎十大傑出商品獎. 大紀元時報 (台北). 2011-12-22. ^ Find a Recipient. The Governor General of Canada. ^ SPJ. Announcing the 2012 Sigma Delta Chi Award winners. 2013-04-23 [2013-05-16] （英语）. ^ Top 100 MBEs, honoring minority and women entrepreneurs. Accessed November 5, 2013. ^ 王凱迪,美國巴爾地摩市. 大紀元時報華府分社榮獲「商業傳奇獎」. 新唐人電視. 2013-11-01. ^ 陳俊村綜合編譯. 英文大紀元頭版 獲選Newseum全球前10佳. 大紀元時報. 2013-10-11. ^ Asian American Chamber of Commerce Award of Chamber Excellence 2015-2016. Asian American Chamber. 2016-05-23. （原始内容存档于2016-06-11）. ^ BETSY MORAIS. The Epoch Times doesn't like to brag. [2016-12-23]. ^ 63.0 63.1 Other Languages. [2014-04-24]. （原始内容存档于2015-07-30） （英语）. ^ 筹办香港大纪元印刷厂的故事 - 大纪元. 大纪元 www.epochtimes.com. 2006-03-04 [2018-12-11]. ^ 大紀元時報在港無處印刷被迫停刊. VOA. 2005-05-12 [2013-05-16] （中文）. ^ 大紀元時報香港分社遭破壞. VOA. 2006-03-01 [2013-05-16] （中文）. ^ 記者章樂. 記者無疆界：攻擊香港大紀元嚴重侵犯媒體自由. 大紀元時報. 2013-06-14 [2013-06-16] （中文）. ^ 美国之音中文网 您可靠的信息来源. 美国之音. [2018-12-11]. ^ 74.0 74.1 74.2 大紀元時報技術總監遭毆打搶劫. 美國之音VOA. 2006-02-08 [2013-05-16] （中文）. ^ 《大紀元》總監 疑遭特務毆. 台灣蘋果日報. 2006-02-17. ^ 76.0 76.1 FBI調查大紀元時報李淵被打案. 美國之音VOA. 2006-02-15 [2013-05-16] （中文）.